The floor is bound to be the busiest part of your home. From people coming in and out of the house to bearing the weight of all your furniture and belongings, your floor will be under constant pressure and stress. That is why the choice of flooring for your home has to be suitable for your needs. If you are on the market for new flooring in Olympia, this article will provide useful information about the different available flooring types, and details that might help kick start the decision-making process. Once you are ready to look into your potential options in more detail, the experts from The Showroom Interior Solutions are available to advise and guide you until the right flooring is selected, and installed. The Showroom Interior Solutions is one of the premier home decor products retailers in the Olympia area, with a wide variety of flooring selections. We also offer design and install services, ensuring a seamless and stress-free experience from start to finish. The following information will be useful to prepare yourself for the conversations we will have in terms of ensuring your home gets the right floor, from the best provider of flooring in Olympia. Hardwood flooring is a great choice, if you are aiming for that timeless feel. Real hardwood flooring has a timeless beauty that is still difficult to imitate, and is highly unlikely to go out of fashion anytime soon. Hardwood flooring is also versatile, coming in a variety of shades and grains, ensuring that each hardwood floor will have its unique characteristics. If you happen to have an existing hardwood floor in need of restoration, The Showroom Interior Solutions is also the place to go. We will support you through the restoration process and ensure that damaged pieces are replaced to match the existing floor. Once the restoration is completed, you will most probably not be able to tell the difference. Tile flooring is another popular choice. Tiles are pretty much maintenance free and do not require sealing. They are also very hard wearing, so very suitable for areas with a lot of traffic and activity. The two main contenders in the tile flooring category are porcelain and ceramic. Porcelain tiles are usually considered as the most hard wearing, as it is very hard to scratch, or chip. It is also very easy to clean. Moreover, porcelain tiles are very compatible with underfloor heating, and come in a wide variety of designs, shapes, and colors that can mimic other surfaces such as wood, concrete, and even leather. Although, porcelain tiles can be more expensive than ceramic tiles, they are a great investment and will provide a unique look to any living space you get them installed in. Ceramic tiles also in a wide range of designs, shapes and colors. They are also very easy to clean. However, they are less expensive than porcelain, but also not as hard wearing. Porcelain tiles may be a better choice for low traffic areas, in the event your budget does not allow for ceramic to be installed in every tiled area of your home. The Showroom Interior Solutions experts are available to discuss the finer points of which type of tile flooring is more suitable for various areas of your home. Laminate flooring is an ingenious development that has emerged as a result of intense focus on home improvement over the last five decades. It is affordable, durable, and prefinished. The hardest part is actually choosing the product. There are two types of laminate flooring: engineered wood and plastic. Engineered wood is made of multiple layers of real wood, glued together in a way that ensures better stability, and topped with a thin hardwood finish layer. Plastic laminate is made of multiple layers of artificial materials (melamine, fiberboard, woodgrain print, and hard clear plastic). 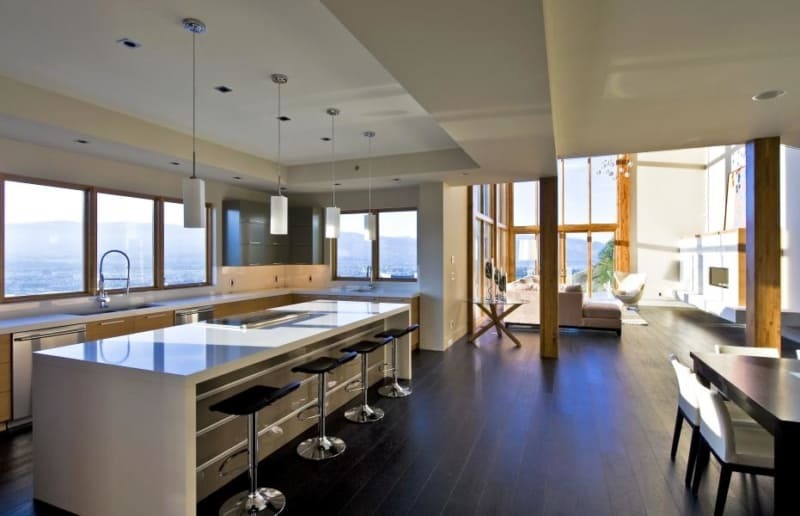 Engineered wood provides a more natural look, but it comes at a higher price tag. It is also less hardwearing than plastic laminate due to its thin top layer. Conversely, plastic laminate is highly durable and suitable for heavy traffic areas. The top coat is literally bulletproof, and the woodgrain prints have become very realistic. The Showroom Interior Solutions recommends that you contact us, or stop by to find out which type of laminate flooring is most suitable for your project. Vinyl flooring has stood the test of time and is often mistaken as the cheap looking flooring solution. Thanks to technological advances, such as hardwearing coatings, vinyl flooring is experiencing a revival and is worth looking into. It could very well be the right choice for some areas of your home. The many benefits of vinyl flooring include variety of styles, affordability, durability, and low maintenance. Like all other flooring types there are considerations to be made in order to determine whether it is the right flooring for your living situation, and The Showroom Interior Solutions has the in-house expertise to guide you through that process in a way that will ensure you are satisfied with your final vinyl flooring choice. Carpet flooring comes in a variety of styles, materials, and quality. All these factors need to be considered to ensure comfort, durability, and most importantly your ongoing satisfaction. Shopping for carpet flooring involves a sizeable financial investment, which it is why it is important that you inform yourself and seek advice from a reputable retailer, such as The Showroom Interior Solutions, in order to ensure that you buy a quality product at the right price. Carpet flooring comes in synthetic and natural fibers. As natural fiber falls in a price range that places it outside most budgets, the following information will focus predominantly on synthetic fibers. Nylon is the most durable synthetic fiber, and is also very easy to maintain. If you want carpet flooring that lasts for a decade or more, and that can be installed in heavy traffic areas, nylon is a great choice. Triexta is a new fiber manufactured in part from corn sugar. Unlike nylon, it does not require treatment with stain protectors over its lifespan. It is also quite durable, but it is still too early to tell whether its durability is comparable to that of nylon in heavy traffic areas. Polyester is soft and is very comfortable to walk on barefoot. It is highly stain resistant, but at the same time harder to clean, and has a tendency to shed. As it does not have the same durability properties as nylon, it is best used in lower traffic areas. Olefin is an affordable, attractive, and strong fiber, with proven resistance to fading. However, it is not as durable as nylon. Other qualities include good resistance to stains, mildew and static. Olefin carpet flooring is generally a good choice for heavy traffic areas that are mostly kept clean, such as family rooms. Whether your budget is geared towards synthetic fiber, or will allow you to explore the luxurious look and feel of natural fiber, The Showroom Interior Solutions is the perfect place to start your quest for the perfect carpet flooring. Regardless of the type of flooring you are interested in, The Showroom Interior Solutions has such a wide range of materials, patterns and colors that you are pretty much guaranteed to find what you are looking for among our collections. Stop by and look at our samples while one of our experts answers your questions and helps you find the right flooring for you. We look forward to welcome you in our showroom!